I liked it's shape, but it had lots of missing veneer. And I know the desk was made before 1961 and traveled from Mesa Arizona, because there were several letters behind the drawers to Kay from the Spring of 1961. No money, no savings bonds... just letters. So I filled, sanded and primed it. Then I decoupaged on some of Jessica Jones's Fireworks fabric on the top, Parade on the front and in the drawers. But the pieces de resistance are the Fabric Button Knobs out of Boardwalk fabric. I'm sure someone has thought of this before, but the only thing I found on the web was covering a wooden knob with fabric. And then you've got these raw edges and a big gluey mess. So yet another use for those crazy You Cover Buttons. And why this frenzy of furniture re-doing, booth building and other such nonsense? Because I decided approximately four weeks before the biggest fabric trade show (for the retail fabric trade anyway) of the year to participate. And why did you wait so long, you ask? Historically, we have not had any products that we wholesaled and it is a wholesale show. Michael Miller Fabrics will be distributing her two new collections to retail stores just like they did Modern Flora. But I also have very mixed feelings about Quilt Market. It has a reputation of being a bit.... okay, I'll just say it... stodgy. And until about 18 months ago, that reputation was well deserved. But thanks to the likes of Free Spirit, Michael Miller, Alexander Henry and designers such as Amy Butler, Anna Maria Horner, Heather Bailey, Sandi Henderson, on and on by the dozens, it is getting to be much more stylish, modern, aesthetically pleasing and .... again, I'll just say it.... more friendly. So, many Quilt Market attendees may not be ready for Jessica Jones's awesomeness, but they are going to see it in its full regalia anyway! (And those of you that are ready-- I anticipate much awesomeness.) Thus the booth. Thus all the work. Thus you are going to be seeing a lot of progress pictures for the next two weeks. I really need to come to your Goodwill. Love the new desk! I especially love the striped print on the inside of the drawers. Very awesome! It sure seems as though this market is more of a sewing market, rather than quilt market. Is there a sewing type of expo that you go to too? I have to say that my local quilt store is still stuck in the uber traditional fabrics and designs phase. Not that I don't appreciate the techniques and history, but I so wish they would welcome in the new wave of younger peeps who want to create with this stuff (I'm 38 and consider myself as one of the "young"). That is so cool! Can't wait to see more pictures of your amazing transformations as you are counting down the days! What an amazing desk. 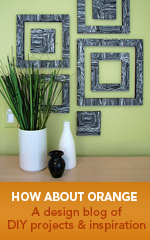 I just saw it posted about on 'How about Orange' What a work of love! That desk is awesome! A super inspiring place to work, for sure! That is so very pretty! Great job! I love that you found the old letters in it too. What a great desk...Totally love the colors. you did a fantastic job on this. so fun and so clever and who wouldn't be happy to sit at that desk. gah! hope you have a lovely time at the quilt show and i'm glad it's progressing with the makes of all these new artists and designers. i'm sure it's going to be a sea of delight. super cool...you must be so pleased! It isn't just a desk of awesomeness. It is THE desk of awesomeness. Hopefully, if all the stars align, I'll be checking out your booth at Quilt Market. Wow! That turned out amazing! Wonderful job, love the fabric covered pulls. What a great idea! Thanks for the how-to. I still can't hardly believe that's the same desk, way to bring it back to life! You did a great job on this desk. I love Jessica's fabrics. ka-pow!-- that is fantastic! what a terrific idea, brilliantly executed... bravo!